Understanding and characterizing each component of the deformity are the keys to treating it successfully. Many treatments have been proposed; the best choices are those that directly address the location of the deformity. For patient education resources, see the Foot, Ankle, Knee, and Hip Center, as well as Chronic Pain. Early in the disease, the medial supporting structures of the first MTP joint (ie, the medial collateral ligaments and medial sesamoid) are typically the first structures to fail. Several other parts of the anatomy begin to fail as well. Once the medial supporting structures fail, the MT head can move medially, off the sesamoid apparatus, and the proximal phalanx falls into a valgus position. The proximal phalanx remains attached by the deep transverse ligament and the adductor hallucis tendon. The rounded head of the first MT articulates with the concave base of the PP. The shape of the MT head plays a large role in the tendency to produce a valgus deformity. A more rounded first MT head is unstable and, therefore, more subject to deformity when acted on by external forces, such as narrow-toed shoes. [7, 8] This is compounded when combined with other commonly associated deformities of the foot, such as pes planus, hindfoot valgus, and congenitally tight heel cord. Flatter MT heads are more stable and less likely to contribute to HV. The second characteristic that contributes to HV is the orientation of the articular surface of the MT head in relation to the long axis of the first MT (see the image below). The distal metatarsal articular angle (DMAA) describes the lateral slope of the articular surface in relation to the long axis of the first MT. Normally, the DMAA is less than 10°. Surgical decision-making must take into account an increased DMAA angle. Distal metatarsal articular angle (DMAA; normal, <10°, average in normal feet, 7°). The orientation of the great toe is also determined by the proximal phalanx articular angle (PPAA). This is the angle formed by the intersection of a line along the long axis of the PP and a line along the proximal joint surface of the PP (see the image below). Deformity at this level contributes to an increased valgus deformity of the first toe; however, the deformity is expressed at the IP joint rather than the MTP joint. Proximal phalanx articular angle (PPAA; normal, <10°). This deformity is within proximal phalanx. The importance of the DMAA and PPAA cannot be overstated, because these angles reflect the lateral inclination of the joint. Correction of these angles must be a goal of any surgery chosen to address the bunion deformity. MTP joint congruence is another factor that is considered in choosing a procedure for bunion correction. The congruence of the joint is determined by combining the PPAA and the DMAA. The lines drawn parallel to the joint surface of both the PP and the first MT head should be parallel (see the image below). When the lines are parallel, a congruent joint exists; when they are not, an incongruous or subluxed joint exists. This relation is important to consider in choosing the surgical procedure. Intra-articular procedures (eg, distal soft-tissue realignment [DSTR]) should not be used with a congruent joint that has an increased DMAA, an increased PPAA, or both. Congruent joints with an increased DMAA must be addressed with extra-articular procedures (ie, osteotomies) in order to prevent converting a congruent joint to an incongruent one. An incongruent joint, because of the unusual stresses on it, would be more prone to develop osteoarthritic changes. The two angles most commonly used to describe the HV deformity are the HV angle (HVA) and the angle formed by the first and second MTs (1-2 intermetatarsal angle [IMA]) (see the image below). Intermetatarsal angle (IMA; normal, <9°). 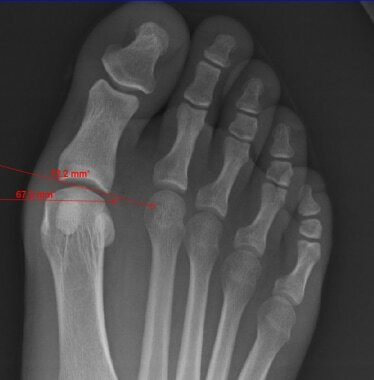 Hallux valgus angle (normal, <15°). The HVA is formed by the intersection of the lines along the long axis of the PP and the first MT. This angle is measured easily. The normal angle should be less than 15°. The next important measurement is the angle formed by the intersecting long axis lines along the first and second MTs. Normally, this angle should be less than 9°. The final joint that must be assessed carefully is the MTC joint. The shape and orientation of this joint vary and affect the medial inclination for the first MT. Reliable radiographic measurements of this joint are difficult to obtain, because these measurements can vary depending on the plane of the radiographic beam. Excessive obliquity is associated with hypermobility instability of the first MTC joint. Hypermobility of the first MT as it moves through its oblique axis from dorsomedial to plantar lateral is believed to contribute to the deformity and is accentuated by the obliquity of the joint. Excessive medial obliquity is associated with instability. In an in-vitro biomechanical study, Khaw et al  were able to demonstrate that whereas the first intermetatarsal ligament is important in stabilizing the first MT in all directions, the plantar aponeurosis is a secondary stabilizer that resists medial and dorsal rotation of the first MT after the first intermetatarsal ligament is divided. It is important to recognize that both the first intermetatarsal ligament and the plantar aponeurosis stabilize the first MT head. The final bony anatomic considerations involve the sesamoids. The sesamoids are located in the flexor hallucis brevis (FHB) tendon and lie under the first MT head. They have an important function for weightbearing and improve the biomechanical axis of the FHB action. The plantar aspect of the first MT head has a longitudinal intersesamoid ridge in its center, termed the crista. The sesamoids lie on either side of this ridge as they articulate with the plantar surface of the first MT head. Normally, they should be centered under the first MT head on the standing anteroposterior (AP) radiograph of the foot. As the great toe develops a valgus deformity, the first MT head deviates medially, and rotation occurs at the MTP joint. The great toe pronates, the intrinsic musculature rotates laterally, and the first MT head displaces medially, subluxing off the sesamoids. Normally, the sesamoids should be centered under the first MT head, and corrective procedures that restore this relation should be chosen. Other considerations in assessing the deformity include associated pes planus deformity, pronation of the great toe, and Achilles tendon (AT) contraction. The AT has a dynamic effect on ambulation. A contracted AT compromises the ability to dorsiflex the foot. During gait, the result is external rotation, with increased demands placed on the medial structures of the forefoot. HV deformity is believed to be a result of this repetitive stress. A contracted AT can be idiopathic or can result from neuromuscular disease. Which of these it derives from should be noted during the physical examination because the presence of contracted AT, if not addressed, can contribute to recurrence of deformity. In addition to the bony anatomy of the deformity, the soft-tissue envelope at the first MTP joint plays a role in the HV deformity. Because the first MT head has no direct muscle attachments, its position is influenced greatly by the alignment of the PP. Essentially, four groups of muscles and tendons cross the first MTP joint and attach on the proximal aspect of the PP. The balance of these structures and the bony contour of the joint determine whether the PP stays aligned on the MT head. Dorsally, the EHL and the extensor hallucis brevis (EHB) insert centrally on the distal and proximal phalanges, respectively. They are kept in a central position by the hood ligaments, a fibrous band of tissue that is anchored to the collateral ligaments. On the plantar surface, the FHL runs centrally between the sesamoids and inserts on the distal phalanx. The FHB has two tendon slips, which insert onto the medial and lateral sesamoids. The sesamoids then connect onto the PP through the plantar plate. Medially, the abductor hallucis tendon inserts onto the plantar medial PP and plantar medial joint capsule. The capsule becomes much thinner dorsally. A similar relation exists on the lateral side of the joint, with the adductor hallucis tendon inserting onto the lateral sesamoid and plantar lateral joint capsule. The adductor hallucis has two muscle bellies, the transverse head and the oblique head. These come together in the conjoined tendon and insert on the lateral sesamoid. Comparatively, more muscle mass is present in the adductor hallucis when the muscle bellies are combined, creating a natural tendency to pull the PP into valgus. These four groups of attachments create a delicate balance for keeping the PP centered on the first MT head. This balance is enhanced greatly when the first MT head is relatively flat. When the head is rounded, it is much easier for the PP to deviate. Once a deviation is created, the forces are quickly unbalanced. The insertion of the adductor hallucis onto the lateral plantar base of the PP becomes the primary deforming force as the HV increases. Because its insertion is on the plantar half of the capsule and sesamoid, it tends to pronate the toe. As the rotation occurs, the abductor hallucis becomes more plantar and the only medial restraint left is the thin dorsal joint capsule, which readily becomes attenuated. Once an angular deformity exists, the EHL and extensor digitorum brevis (EDB) are no longer centered on the PP and bowstring across the lateral side of the deformity, creating further imbalance. In considering the treatment of HV, one must address both the bony deformity and the soft-tissue balance, because both contribute to the pathologic condition. In a 2-year follow-up study evaluating the effect of three different types of HV surgeries, Thordarson et al  reported that patients who had HV surgery had significant improvements in four of their Short Form (SF)-36 scores, in four of five American Academy of Orthopaedic Surgeons (AAOS) lower-extremity scores, and in four of five American Orthopaedic Foot and Ankle Society (AOFAS) scores. The degree of deformity, amount of correction, and type of operation did not influence outcome. When treatment addresses each component of the deformity, satisfactory results are possible. However, patients must have realistic expectations. Recurrent deformity, HV, and stiffness are the most common complications. Even with good corrections, some limitations still exist in 30% of patients. Bauer T, Biau D, Lortat-Jacob A, Hardy P. Percutaneous hallux valgus correction using the Reverdin-Isham osteotomy. Orthop Traumatol Surg Res. 2010 Jun. 96(4):407-16. [Medline]. Mann RA, Coughlin MJ. Hallux valgus--etiology, anatomy, treatment and surgical considerations. Clin Orthop Relat Res. 1981 Jun. (157):31-41. [Medline]. Coughlin MJ. Hallux valgus. Instr Course Lect. 1997. 46:357-91. [Medline]. Coughlin MJ, Anderson RB. Hallux valgus. Coughlin MJ, Saltzman CL, Anderson RB, eds. Mann's Surgery of the Foot and Ankle. 8th ed. Philadelphia: Elsevier Saunders; 2014. Vol 1: 155-321. Perera AM, Mason L, Stephens MM. The pathogenesis of hallux valgus. J Bone Joint Surg Am. 2011 Sep 7. 93(17):1650-61. [Medline]. Lui TH. First metatarsophalangeal joint arthroscopy in patients with hallux valgus. Arthroscopy. 2008 Oct. 24(10):1122-9. [Medline]. Coughlin MJ, Thompson FM. The high price of high-fashion footwear. Instr Course Lect. 1995. 44:371-7. [Medline]. Hattrup SJ, Johnson KA. Chevron osteotomy: analysis of factors in patients' dissatisfaction. Foot Ankle. 1985 May-Jun. 5(6):327-32. [Medline]. Richardson EG, Graves SC, McClure JT, et al. First metatarsal head-shaft angle: a method of determination. Foot Ankle. 1993 May. 14(4):181-5. [Medline]. Khaw FM, Mak P, Johnson GR, Briggs PJ. Distal ligamentous restraints of the first metatarsal. An in vitro biomechanical study. Clin Biomech (Bristol, Avon). 2005 Jul. 20 (6):653-8. [Medline]. Frey C, Thompson F, Smith J, et al. American Orthopaedic Foot and Ankle Society women's shoe survey. Foot Ankle. 1993 Feb. 14(2):78-81. [Medline]. Nguyen US, Hillstrom HJ, Li W, Dufour AB, Kiel DP, Procter-Gray E, et al. Factors associated with hallux valgus in a population-based study of older women and men: the MOBILIZE Boston Study. Osteoarthritis Cartilage. 2010 Jan. 18 (1):41-6. [Medline]. D'Arcangelo PR, Landorf KB, Munteanu SE, Zammit GV, Menz HB. 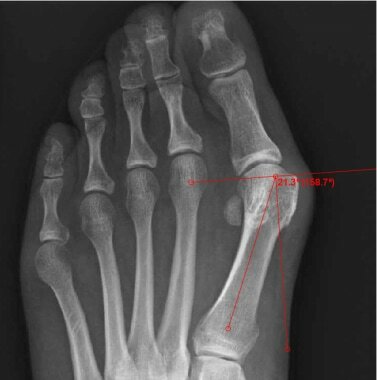 Radiographic correlates of hallux valgus severity in older people. J Foot Ankle Res. 2010 Sep 16. 3:20. [Medline]. Klein C, Groll-Knapp E, Kundi M, Kinz W. Increased hallux angle in children and its association with insufficient length of footwear: a community based cross-sectional study. BMC Musculoskelet Disord. 2009 Dec 17. 10:159. [Medline]. BONNEY G, MACNAB I. Hallux valgus and hallux rigidus; a critical survey of operative results. J Bone Joint Surg Br. 1952 Aug. 34-B(3):366-85. [Medline]. Piqué-Vidal C, Solé MT, Antich J. Hallux valgus inheritance: pedigree research in 350 patients with bunion deformity. J Foot Ankle Surg. 2007 May-Jun. 46(3):149-54. [Medline]. HARDY RH, CLAPHAM JC. Observations on hallux valgus; based on a controlled series. J Bone Joint Surg Br. 1951 Aug. 33-B(3):376-91. [Medline]. Nery C, Coughlin MJ, Baumfeld D, Ballerini FJ, Kobata S. Hallux valgus in males--part 1: demographics, etiology, and comparative radiology. Foot Ankle Int. 2013 May. 34(5):629-35. [Medline]. Coughlin MJ. Roger A. Mann Award. Juvenile hallux valgus: etiology and treatment. Foot Ankle Int. 1995 Nov. 16(11):682-97. [Medline]. Piggott H. The natural history of hallux valgus in adolescence and early adult life. J Bone Joint Surg. 1960. 42:749-60. Thordarson DB, Ebramzadeh E, Rudicel SA, et al. Age-adjusted baseline data for women with hallux valgus undergoing corrective surgery. J Bone Joint Surg Am. 2005 Jan. 87(1):66-75. [Medline]. Tai CC, Ridgeway S, Ramachandran M, Ng VA, Devic N, Singh D. Patient expectations for hallux valgus surgery. J Orthop Surg (Hong Kong). 2008 Apr. 16(1):91-5. [Medline]. Klaue K, Hansen ST, Masquelet AC. Clinical, quantitative assessment of first tarsometatarsal mobility in the sagittal plane and its relation to hallux valgus deformity. Foot Ankle Int. 1994 Jan. 15(1):9-13. [Medline]. Robinson AH, Limbers JP. Modern concepts in the treatment of hallux valgus. J Bone Joint Surg Br. 2005 Aug. 87(8):1038-45. [Medline]. Kennedy JG, Collumbier JA. Bunions in dancers. Clin Sports Med. 2008 Apr. 27(2):321-8. [Medline]. Chhaya SA, Brawner M, Hobbs P, Chhaya N, Garcia G, Loredo R. Understanding hallux valgus deformity: what the surgeon wants to know from the conventional radiograph. Curr Probl Diagn Radiol. 2008 May-Jun. 37(3):127-37. [Medline]. Burg A, Hadash O, Tytiun Y, Salai M, Dudkiewicz I. Do weight-bearing films affect decision making in hallux valgus surgery?. J Foot Ankle Surg. 2012 May-Jun. 51(3):293-5. [Medline]. Smith WB, Dayton P, Santrock RD, Hatch DJ. Understanding Frontal Plane Correction in Hallux Valgus Repair. Clin Podiatr Med Surg. 2018 Jan. 35 (1):27-36. [Medline]. Santrock RD, Smith B. Hallux Valgus Deformity and Treatment: A Three-Dimensional Approach: Modified Technique for Lapidus Procedure. Foot Ankle Clin. 2018 Jun. 23 (2):281-295. [Medline]. Thordarson D, Ebramzadeh E, Moorthy M, et al. 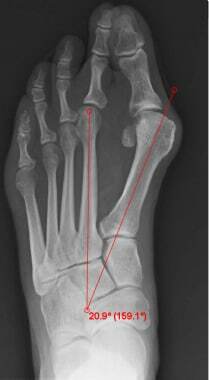 Correlation of hallux valgus surgical outcome with AOFAS forefoot score and radiological parameters. Foot Ankle Int. 2005 Feb. 26(2):122-7. [Medline]. Menz HB, Morris ME. Footwear characteristics and foot problems in older people. Gerontology. 2005 Sep-Oct. 51(5):346-51. [Medline]. Torkki M, Malmivaara A, Seitsalo S, Hoikka V, Laippala P, Paavolainen P. Surgery vs orthosis vs watchful waiting for hallux valgus: a randomized controlled trial. JAMA. 2001 May 16. 285(19):2474-80. [Medline]. Sammarco VJ, Nichols R. Orthotic management for disorders of the hallux. Foot Ankle Clin. 2005 Mar. 10(1):191-209. [Medline]. Reina M, Lafuente G, Munuera PV. Effect of custom-made foot orthoses in female hallux valgus after one-year follow up. Prosthet Orthot Int. 2013 Apr. 37(2):113-9. [Medline]. Hart ES, deAsla RJ, Grottkau BE. Current concepts in the treatment of hallux valgus. Orthop Nurs. 2008 Sep-Oct. 27(5):274-80; quiz 281-2. [Medline]. Elliot RR, Saxby TS, Whitehouse SL. Intraoperative imaging in hallux valgus surgery. Foot Ankle Surg. 2012 Mar. 18(1):19-21. [Medline]. McBride ED. The McBride bunion hallux valgus operation. J Bone Joint Surg Am. 1967 Dec. 49(8):1675-83. [Medline]. Coughlin MJ, Jones CP, Viladot R, et al. Hallux valgus and first ray mobility: a cadaveric study. Foot Ankle Int. 2004 Aug. 25(8):537-44. [Medline]. Schneider W. Influence of different anatomical structures on distal soft tissue procedure in hallux valgus surgery. Foot Ankle Int. 2012 Nov. 33(11):991-6. [Medline]. Akin OF. The treatment of hallux valgus: a new operative procedure and its results. Medical Sentinel. 1925. 33:678-679. Brahms MA. Hallux valgus--the akin procedure. Clin Orthop Relat Res. 1981 Jun. 47-9. [Medline]. Goldberg I, Bahar A, Yosipovitch Z. Late results after correction of hallux valgus deformity by basilar phalangeal osteotomy. J Bone Joint Surg Am. 1987 Jan. 69(1):64-7. [Medline]. Plattner PF, Van Manen JW. Results of Akin type proximal phalangeal osteotomy for correction of hallux valgus deformity. Orthopedics. 1990 Sep. 13(9):989-96. [Medline]. Mitchell LA, Baxter DE. A Chevron-Akin double osteotomy for correction of hallux valgus. Foot Ankle. 1991 Aug. 12(1):7-14. [Medline]. Barouk LS, Barouk P, Baudet B, et al. The great toe proximal phalanx osteotomy: the final step of the bunionectomy. Foot Ankle Clin. 2005 Mar. 10(1):141-55. [Medline]. Basile A, Battaglia A, Campi A. Retrospective analysis of the Ludloff osteotomy for correction of severe hallux valgus deformity. Foot and Ankle Surgery. 2001. 7(1):1â€"8. Chuckpaiwong B. 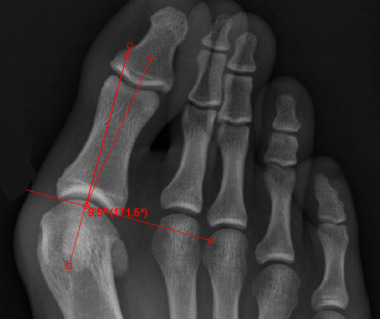 Comparing proximal and distal metatarsal osteotomy for moderate to severe hallux valgus. Int Orthop. 2012 Nov. 36(11):2275-8. [Medline]. Austin DW, Leventen EO. A new osteotomy for hallux valgus: a horizontally directed "V" displacement osteotomy of the metatarsal head for hallux valgus and primus varus. Clin Orthop Relat Res. 1981 Jun. (157):25-30. [Medline]. Johnson JE, Clanton TO, Baxter DE, et al. Comparison of Chevron osteotomy and modified McBride bunionectomy for correction of mild to moderate hallux valgus deformity. Foot Ankle. 1991 Oct. 12(2):61-8. [Medline]. Johnson KA, Cofield RH, Morrey BF. Chevron osteotomy for hallux valgus. Clin Orthop Relat Res. 1979 Jul-Aug. 44-7. [Medline]. Magnan B, Pezzè L, Rossi N, et al. Percutaneous distal metatarsal osteotomy for correction of hallux valgus. J Bone Joint Surg Am. 2005 Jun. 87(6):1191-9. [Medline]. Sanna P, Ruiu GA. Percutaneous distal osteotomy of the first metatarsal (PDO) for the surgical treatment of hallux valgus. Chir Organi Mov. 2005 Oct-Dec. 90(4):365-9. [Medline]. Nikolaou VS, Korres D, Xypnitos F, Lazarettos J, Lallos S, Sapkas G, et al. Fixation of Mitchell's osteotomy with bioabsorbable pins for treatment of hallux valgus deformity. Int Orthop. 2009 Jun. 33 (3):701-6. [Medline]. Yamamoto K, Imakiire A, Katori Y, et al. Clinical results of modified Mitchell's osteotomy for hallux valgus augmented with oblique lesser metatarsal osteotomy. J Orthop Surg (Hong Kong). 2005 Dec. 13(3):245-52. [Medline]. Lee KB, Seo CY, Hur CI, Moon ES, Lee JJ. Outcome of proximal chevron osteotomy for hallux valgus with and without transverse Kirschner wire fixation. Foot Ankle Int. 2008 Nov. 29(11):1101-6. [Medline]. Kürklü M, Demiralp B, Yurttas Y, Ciçek EI, Atesalp AS. Modified chevron osteotomy fixed with stofella pin for hallux valgus. Foot Ankle Int. 2008 May. 29(5):478-82. [Medline]. Matzaroglou C, Bougas P, Panagiotopoulos E, Saridis A, Karanikolas M, Kouzoudis D. Ninety-degree chevron osteotomy for correction of hallux valgus deformity: clinical data and finite element analysis. Open Orthop J. 2010. 4:152-6. [Medline]. Akman B, Sahin A, Turan Y, Ozkan K, Eren A, Ozkan NK. Early results of distal metatarsal osteotomy with K-wire fixation in the treatment of tailor's bunion. Acta Orthop Traumatol Turc. 2011. 45(6):431-6. [Medline]. Deorio JK, Ware AW. Single absorbable polydioxanone pin fixation for distal chevron bunion osteotomies. Foot Ankle Int. 2001 Oct. 22(10):832-5. [Medline]. Kuhn MA, Lippert FG, Phipps MJ. Blood flow to the metatarsal head after chevron bunionectomy. Foot Ankle Int. 2005 Jul. 26(7):526-9. [Medline]. Maguire WB. The Lapidus procedure for hallux valgus. J Bone Joint Surg Am. 1973. 55B:221. Trnka HJ, Zembsch A, Easley ME, et al. The chevron osteotomy for correction of hallux valgus. Comparison of findings after two and five years of follow-up. J Bone Joint Surg Am. 2000 Oct. 82-A(10):1373-8. [Medline]. Ozkurt B, Aktekin CN, Altay M, Belhan O, Tabak Y. Range of motion of the first metatarsophalangeal joint after chevron procedure reinforced by a modified capsuloperiosteal flap. Foot Ankle Int. 2008 Sep. 29(9):903-9. [Medline]. Smith SE, Landorf KB, Butterworth PA, Menz HB. Scarf versus chevron osteotomy for the correction of 1-2 intermetatarsal angle in hallux valgus: a systematic review and meta-analysis. J Foot Ankle Surg. 2012 Jul-Aug. 51(4):437-44. [Medline]. Okuda R, Kinoshita M, Yasuda T, Jotoku T, Shima H. Proximal metatarsal osteotomy for hallux valgus: comparison of outcome for moderate and severe deformities. Foot Ankle Int. 2008 Jul. 29(7):664-70. [Medline]. Paczesny L, Kruczyński J, Adamski R. Scarf versus proximal closing wedge osteotomy in hallux valgus treatment. Arch Orthop Trauma Surg. 2009 Oct. 129 (10):1347-52. [Medline]. Gupta S, Fazal MA, Williams L. Minifragment screw fixation of the Scarf osteotomy. Foot Ankle Int. 2008 Apr. 29(4):385-9. [Medline]. Lipscombe S, Molloy A, Sirikonda S, Hennessy MS. Scarf osteotomy for the correction of hallux valgus: midterm clinical outcome. J Foot Ankle Surg. 2008 Jul-Aug. 47(4):273-7. [Medline]. Trnka HJ, Hofstaetter SG, Hofstaetter JG, Gruber F, Adams SB Jr, Easley ME. Intermediate-term results of the Ludloff osteotomy in one hundred and eleven feet. J Bone Joint Surg Am. 2008 Mar. 90(3):531-9. [Medline]. Hyer CF, Glover JP, Berlet GC, Philbin TM, Lee TH. A comparison of the crescentic and Mau osteotomies for correction of hallux valgus. J Foot Ankle Surg. 2008 Mar-Apr. 47(2):103-11. [Medline]. Glover JP, Hyer CF, Berlet GC, Lee TH. Early results of the Mau osteotomy for correction of moderate to severe hallux valgus: a review of 24 cases. J Foot Ankle Surg. 2008 May-Jun. 47(3):237-42. [Medline]. Mann RA, Rudicel S, Graves SC. Repair of hallux valgus with a distal soft-tissue procedure and proximal metatarsal osteotomy. A long-term follow-up. J Bone Joint Surg Am. 1992 Jan. 74(1):124-9. [Medline]. Sammarco GJ, Brainard BJ, Sammarco VJ. Bunion correction using proximal Chevron osteotomy. Foot Ankle. 1993 Jan. 14(1):8-14. [Medline]. Thordarson DB, Leventen EO. Hallux valgus correction with proximal metatarsal osteotomy: two-year follow-up. Foot Ankle. 1992 Jul-Aug. 13(6):321-6. [Medline]. Wanivenhaus AH, Feldner-Busztin H. Basal osteotomy of the first metatarsal for the correction of metatarsus primus varus associated with hallux valgus. Foot Ankle. 1988 Jun. 8(6):337-43. [Medline]. Choi WJ, Yoon HK, Yoon HS, Kim BS, Lee JW. Comparison of the proximal chevron and Ludloff osteotomies for the correction of hallux valgus. Foot Ankle Int. 2009 Dec. 30(12):1154-60. [Medline]. Easley ME, Kiebzak GM, Davis WH, Anderson RB. Prospective, randomized comparison of proximal crescentic and proximal chevron osteotomies for correction of hallux valgus deformity. Foot Ankle Int. 1996 Jun. 17(6):307-16. [Medline]. Beischer AD, Ammon P, Corniou A, et al. Three-dimensional computer analysis of the modified Ludloff osteotomy. Foot Ankle Int. 2005 Aug. 26(8):627-32. [Medline]. Jung HG, Guyton GP, Parks BG, et al. Supplementary axial Kirschner wire fixation for crescentic and Ludloff proximal metatarsal osteotomies: a biomechanical study. Foot Ankle Int. 2005 Aug. 26(8):620-6. [Medline]. Unver B, Sampiyon O, Karatosun V. Postoperative immobilisation orthosis for surgically corrected hallux valgus. Prosthet Orthot Int. 2004 Dec. 28(3):278-80. [Medline]. Brodsky JW, Beischer AD, Robinson AH, et al. Surgery for hallux valgus with proximal crescentic osteotomy causes variable postoperative pressure patterns. Clin Orthop Relat Res. 2006 Feb. 443:280-6. [Medline]. Jones CP, Coughlin MJ, Grebing BR. First metatarsophalangeal joint motion after hallux valgus correction: a cadaver study. Foot Ankle Int. 2005 Aug. 26(8):614-9. [Medline]. Okuda R, Kinoshita M, Morikawa J, et al. Proximal metatarsal osteotomy: relation between 1- to greater than 3-years results. Clin Orthop Relat Res. 2005 Jun. 191-6. [Medline]. Mauldin DM, Sanders M, Whitmer WW. Correction of hallux valgus with metatarsocuneiform stabilization. Foot Ankle. 1990 Oct. 11(2):59-66. [Medline]. Myerson M. Metatarsocuneiform arthrodesis for treatment of hallux valgus and metatarsus primus varus. Orthopedics. 1990 Sep. 13(9):1025-31. [Medline]. Sangeorzan BJ, Hansen ST. Modified Lapidus procedure for hallux valgus. Foot Ankle. 1989 Jun. 9(6):262-6. [Medline]. Coetzee JC, Resig SG, Kuskowski M, et al. The Lapidus procedure as salvage after failed surgical treatment of hallux valgus: a prospective cohort study. J Bone Joint Surg Am. 2003 Jan. 85-A(1):60-5. [Medline]. Coughlin MJ, Smith BW. Hallux valgus and first ray mobility. Surgical technique. J Bone Joint Surg Am. 2008 Oct. 90 Suppl 2 Pt 2:153-70. [Medline]. Gérard R, Stern R, Assal M. The modified Lapidus procedure. Orthopedics. 2008 Mar. 31(3):230-6. [Medline]. Kopp FJ, Patel MM, Levine DS, et al. The modified Lapidus procedure for hallux valgus: a clinical and radiographic analysis. Foot Ankle Int. 2005 Nov. 26(11):913-7. [Medline]. Fuhrmann RA. Arthrodesis of the first tarsometatarsal joint for correction of the advanced splayfoot accompanied by a hallux valgus. Oper Orthop Traumatol. 2005 Jun. 17(2):195-210. [Medline]. Coughlin MJ. Arthrodesis of the first metatarsophalangeal joint with mini-fragment plate fixation. Orthopedics. 1990 Sep. 13(9):1037-44. [Medline]. Mann RA, Katcherian DA. Relationship of metatarsophalangeal joint fusion on the intermetatarsal angle. Foot Ankle. 1989 Aug. 10(1):8-11. [Medline]. Mann RA, Oates JC. Arthrodesis of the first metatarsophalangeal joint. Foot Ankle. 1980 Nov. 1(3):159-66. [Medline]. Turan I, Lindgren U. Compression-screw arthrodesis of the first metatarsophalangeal joint of the foot. Clin Orthop Relat Res. 1987 Aug. 292-5. [Medline]. Coughlin MJ, Grebing BR, Jones CP. Arthrodesis of the first metatarsophalangeal joint for idiopathic hallux valgus: intermediate results. Foot Ankle Int. 2005 Oct. 26(10):783-92. [Medline]. Cronin JJ, Limbers JP, Kutty S, et al. Intermetatarsal angle after first metatarsophalangeal joint arthrodesis for hallux valgus. Foot Ankle Int. 2006 Feb. 27(2):104-9. [Medline]. Rippstein PF, Park YU, Naal FD. Combination of first metatarsophalangeal joint arthrodesis and proximal correction for severe hallux valgus deformity. Foot Ankle Int. 2012 May. 33(5):400-5. [Medline]. Faber FW, Mulder PG, Verhaar JA. Role of first ray hypermobility in the outcome of the Hohmann and the Lapidus procedure. A prospective, randomized trial involving one hundred and one feet. J Bone Joint Surg Am. 2004 Mar. 86-A(3):486-95. [Medline]. Richardson EG. Keller resection arthroplasty. Orthopedics. 1990 Sep. 13(9):1049-53. [Medline]. Vallier GT, Petersen SA, LaGrone MO. The Keller resection arthroplasty: a 13-year experience. Foot Ankle. 1991 Feb. 11(4):187-94. [Medline]. Wrighton JD. A ten-year review of Keller's operation. Review of Keller's operation at the Princess Elizabeth Orthopaedic Hospital, Exeter. Clin Orthop Relat Res. 1972. 89:207-14. [Medline]. Becerro de Bengoa Vallejo R, Losa Iglesias ME, Viejo Tirado F, Prados Frutos JC, Jules KT. Use of a Kirschner wire for distraction and capsular flaps in the Keller interpositional arthroplasty. J Am Podiatr Med Assoc. 2008 Jul-Aug. 98(4):326-9. [Medline]. Turnbull T, Grange W. A comparison of Keller's arthroplasty and distal metatarsal osteotomy in the treatment of adult hallux valgus. J Bone Joint Surg Br. 1986 Jan. 68(1):132-7. [Medline]. O'Doherty DP, Lowrie IG, Magnussen PA, Gregg PJ. The management of the painful first metatarsophalangeal joint in the older patient. Arthrodesis or Keller's arthroplasty?. J Bone Joint Surg Br. 1990 Sep. 72(5):839-42. [Medline]. Zembsch A, Trnka HJ, Ritschl P. Correction of hallux valgus. Metatarsal osteotomy versus excision arthroplasty. Clin Orthop Relat Res. 2000 Jul. (376):183-94. [Medline]. Maffulli N, Longo UG, Marinozzi A, Denaro V. Hallux valgus: effectiveness and safety of minimally invasive surgery. A systematic review. Br Med Bull. 2011. 97:149-67. [Medline]. Roukis TS. Percutaneous and minimum incision metatarsal osteotomies: a systematic review. J Foot Ankle Surg. 2009 May-Jun. 48(3):380-7. [Medline]. Bauer T. Percutaneous forefoot surgery. Orthop Traumatol Surg Res. 2014 Feb. 100(1S):S191-S204. [Medline]. Bauer T, de Lavigne C, Biau D, De Prado M, Isham S, Laffenétre O. Percutaneous hallux valgus surgery: a prospective multicenter study of 189 cases. Orthop Clin North Am. 2009 Oct. 40(4):505-14, ix. [Medline]. Kadakia AR, Smerek JP, Myerson MS. Radiographic results after percutaneous distal metatarsal osteotomy for correction of hallux valgus deformity. Foot Ankle Int. 2007 Mar. 28(3):355-60. [Medline]. Magnan B, Negri S, Maluta T, Dall'Oca C, Samaila E. Minimally invasive distal first metatarsal osteotomy can be an option for recurrent hallux valgus. Foot Ankle Surg. 2018 Jan 12. [Medline]. Díaz Fernández R. Percutaneous Triple and Double Osteotomies for the Treatment of Hallux Valgus. Foot Ankle Int. 2017 Feb. 38 (2):159-166. [Medline]. Giannini S et al. Hallux valgus surgery: the minimally invasive bunion correction (SERI). Tech Foot Ankle Surg. 2003. 2 (1):11-20. Maffulli N, Longo UG, Oliva F, Denaro V, Coppola C. Bosch osteotomy and scarf osteotomy for hallux valgus correction. Orthop Clin North Am. 2009 Oct. 40(4):515-24, ix-x. [Medline]. Roth A, Kohlmaier W, Tschauner C. Surgery of hallus valgus. Distal metatarsal osteotomy--subcutaneous ('Bosch') versus open ('Kramer') procedures. Foot Ankle Surg. 1996. 109-17. Lui TH, Chan KB. Technical tip: Reconstruction of medial collateral ligament in correction of hallux valgus deformity with primary medial collateral ligamentous insufficiency. Foot Ankle Surg. 2012 Mar. 18(1):66-73. [Medline]. Michels F, Guillo S, de Lavigne C, Van Der Bauwhede J. The arthroscopic Lapidus procedure. Foot Ankle Surg. 2011 Mar. 17(1):25-8. [Medline]. Coetzee JC, Wickum D. The Lapidus procedure: a prospective cohort outcome study. Foot Ankle Int. 2004 Aug. 25(8):526-31. [Medline]. Bednarz PA, Manoli A 2nd. Modified lapidus procedure for the treatment of hypermobile hallux valgus. Foot Ankle Int. 2000 Oct. 21(10):816-21. [Medline]. Ahn JH, Choy WS, Lee KW. Arthroscopy of the first metatarsophalangeal joint in 59 consecutive cases. J Foot Ankle Surg. 2012 Mar-Apr. 51(2):161-7. [Medline]. Apfelbaum JL, Desjardins PJ, Brown MT, Verburg KM. Multiple-day efficacy of parecoxib sodium treatment in postoperative bunionectomy pain. Clin J Pain. 2008 Nov-Dec. 24 (9):784-92. [Medline]. Akin proximal phalanx closing-wedge osteotomy to correct high proximal phalangeal articular angle (PPAA). Distal chevron metatarsal osteotomy fixed with Kirschner wire. Proximal chevron osteotomy fixed with 2 screws. Note Akin proximal phalanx osteotomy fixed with Kirschner wires (K-wires) and hammertoe correction held with K-wire. Proximal chevron osteotomy fixed with 2 screws. 22-year-old woman with hypermobile first ray, first and second intermetatarsal angle of 18°. Lapidus procedure preoperative image (left) and 6 months' postoperative image (right). 50-year-old woman with bilateral severe hallux valgus deformity. Postoperative films after Lapidus procedures in 50-year-old woman with bilateral severe hallux valgus deformity. Disclosure: Received grant/research funds from AOFAS for none; Received grant/research funds from Ohio Third Frontier for none; Received grant/research funds from Wright State University Boonshoft School of Medicine Seed Grant for none; Received none from AOFAS for post grad education committee; Received none from Dayton Area Graduate Medical Education Consortium (DAGMEC) for member; Received none from Mid-America Orthopaedic Association for education committee; Received ownership interest from South Surger.